The latest release of Opera is out, and it brings some great improvements to two of the browsers beloved features, Opera Turbo, and the Speed Dial. The updated Opera Turbo now promises of offer greater compression than ever while simultaneously improving on quality. Opera Turbo now uses Google's new open WebP image format rather than JPEG making such improvements possible. Of course since Opera is using WebP in turbo, they have also added support for the format in the browser. While the format is far from popular - in fact it is currently not supported in any major image editor or viewer - supporting this new open format means that there is hope that the format will take off with time. You can check out a gallery of WebP images here. 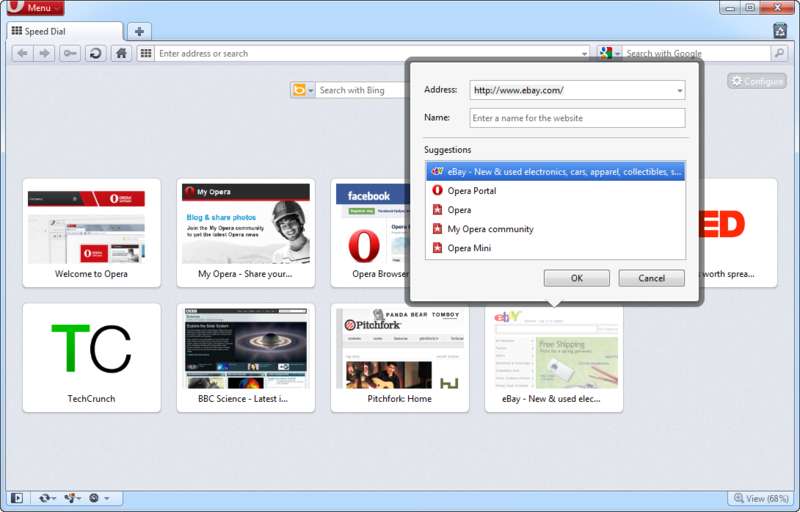 The other big change is in how Opera's Speed Dial works. In recent versions Opera added support for more speed dial layouts. This feature has not received the ultimate upgrade. It now supports unlimited entries, and the layout fluidly accommodates any new entries you add rather than displaying an inflexible grid with some missing entries. Additionally, you can zoom into or out of the Speed Dial and the entries will fluidly take the optimum layout. Another update to Speed Dial is the thumbnails displayed. While thumbnails are useful, most sites when displayed in their entirety in a small thumbnail window become indiscernible. Opera now lets website authors specify what should be shown in this thumbnail. This thumbnail need not be static either, it can provide dynamic content, even animated content that can pull information from your account, making it more personal. Opera 11.10 also comes with improved support for web standards, with CSS3 multi-column layouts, WOFF fonts support, CSS3 gradients and more.Plug-in detection and installation has now also been automated, so if you visit a website that requires the Flash Player and you don't have it installed, Opera will download and install it automatically. What lies ahead is Opera 11.50, preview builds of which are already available. This version is expected to finally bring hardware acceleration to the Opera browser, and will feature an HTML5 parser, which is one of the most important parts of the new web standard.